Location: To the west of Forden on the south side of the level crossing which carries a minor road over the line. Present state: Station demolished station house extant. Notes: Forden station was situated on the Cambrian Railway (CR) main line that linked Aberystwyth and Whitchurch. 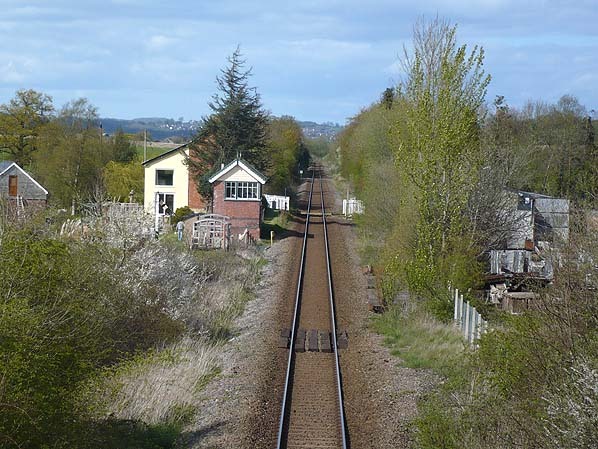 The section of line on which the station was located was opened between Welshpool and Abermule by the Oswestry & Newtown Railway (O&NR) on 10 June 1861. They had previously opened a section of line between Oswestry and Pool Quay on 1 May 1860 and between Newtown and Abermule on 14 August 1860. At Newtown the O&NR had an end-on connection with the Llanidloes & Newtown Railway (L&N) which had opened to goods services on 30 April 1859. On 25 July 1864 the L&N and O&NR merged with the Oswestry, Ellesmere & Whitchurch Railway and the Newtown & Machynlleth Railway to form the CR (which also absorbed the Aberystwyth & Welch [sic] Coast Railway in 1865). The merger of the companies created the through route between Aberystwyth and Whitchurch. 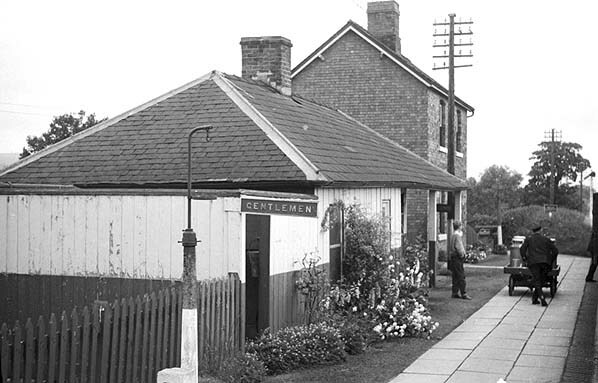 Forden station opened with the line on 10 June 1861 and was located just under a mile west of its village namesake on the south side of a minor road which crossed the line by means of a level crossing. The line was single track and the station was on its western side. There was one platform 2ft 6in high, constructed with a stone face backfilled with earth and cinders and paved towards its northern end. At the north end of the platform the particularly plain, brick-built station house was provided. It was of two storeys under a pitched roof, and only the shallow segmental arches of the door and window openings relieved the austerity of the structure. The main station facilities were located to the south of the house in a single-storey timber building under a hipped roof. At its northern end the building was recessed to provide shelter, the overhanging roof being supported by two crude timber posts. Forden was provided with a goods siding and shed east of the line to the south of the passenger facilities. At the time of opening six trains were operated in each direction on weekdays running between Oswestry and Llanidloes. There were two trains in each direction on Sunday. With the opening of the line to Machynlleth on 3 January 1863 trains also started to serve that destination. By 1864 the CR main line was complete and Forden had up services to Oswestry and Whitchurch and down trains to Machynlleth and Llanidloes. The December 1895 timetable showed three trains in each direction on Monday-to-Saturday. On Tuesday there was an extra down train. Other trains would stop upon request. There was one train in each direction on Sunday. In June 1897 a passing loop was installed at Forden. The new track was located east of the original and became the down line (Newtown direction). The original line became the up (Oswestry direction). To serve the down line a new platform was provided. It was constructed in the same way as the up but it was 6in higher (at 3ft). The new loop and platform was inspected by Col. Yorke who made it a requirement that a waiting shelter be provided on the up platform. It was reported to have been in place after March 1898. This enclosed waiting room was at the north end of the down platform in a timber, pitched-roof structure embellished with finials on the bargeboards. To control the passing loop a signal box was provided. It was located at the mid-point of the up platform. It was a brick structure with timber upper frontage. The goods facilities were altered with two sidings being provided that extended northwards to the rear of the down platform. At 7.18pm on 26 November 1904 there was a head-on collision at Forden station between the down 7.05pm Welshpool to Llanidloes passenger train and an up goods from Machynlleth. The accident occurred because Edwin Corfield, the Forden stationmaster at that time, directed the up goods onto the down line. He did so because Mr Hughes, a local farmer, had four horses on the goods train which he had bought at Machynlleth Fair. Mr Hughes was keen to get his horses unloaded as quickly as possible. As the weather was frosty the Station Master thought that it would be safer to unload the horses at the down platform because it was higher than the up. Edwin Corfield knew that the passenger train had left Welshpool but he believed he had time to unload the horses. He asked signal porter Richard Ashton to put the signals to danger so that if the passenger train did arrive it could be held outside the station. In his statement to the accident investigating officer Edwin Corfield maintained that he also told signal porter Ashton to set the points for the up platform so that if the train did pass the signals it would not run into the goods train on at the down platform. Richard Ashton in his statement disputed this and said he was never told to set the points in that way. Richard Ashton went to the down platform after he had set the signals and assisted with the unloading of the horses. Stationmaster Corfield was in the wagon getting the last horse out when the passenger train came into the station and hit the goods train. Edwin Corfield was knocked to the ground and the horse trod on his head. The loco crew had expected a clear run into the station. Owing to foggy conditions they had not seen the signals at danger until it was too late. The brakes had been applied and the train was slowed down but it could not be stopped in time. Five passengers, the fireman of the goods engine and stationmaster Corfield were injured. Travelling on the passenger train was Levi Cooper, a stationmaster from Llangedwyn who was on annual leave. He took control of the situation informing both Welshpool and Montgomery stations of the mishap. He also summoned medical assistance from a local doctor who arrived at 8.00pm. Lt- Col Royal Engineers, E Druitt, in his report into the accident dated 8 December 1904 blamed Edwin Corfield for the accident as he had clearly broken the rules for working a single-line railway on the electric tablet system. On 1 January 1922 the CR was absorbed into the Great Western Railway (GWR). The July 1922 timetable showed five up and four down trains on Monday-to-Saturday as seen in the table below. No trains called on Sunday. In 1925 the line between Forden and Welshpool was doubled to provide extra capacity and allow faster journey times. The GWR made other improvements to the former CR line and introduced faster direct services to London. On 1 January 1948 Forden became part of British Railways [Western Region] (BR[WR]). The 19 September 1955 timetable showed seven up and five down trains on Monday-to-Saturday and no trains on Sunday. On 1 January 1963 Forden passed to the operational control of British Railways [London Midland Region] (BR [LMR]). Three months later the Reshaping of British Railways report (the ‘Beeching Report’) was published. What was, by then, the main through route from Shrewsbury to Aberystwyth was to be retained for passenger traffic, but with only Welshpool, Newtown, Machynlleth and Dovey Junction stations to remain open. Curiously, the Dovey Junction to Pwllheli line was to be left unscathed. Forden’s goods services were withdrawn on 4 May 1964. On 15 May 1964 the intention to close the intermediate stations named by Beeching, including Forden, was published. On 29 December 1964 the Minister of Transport, Thomas Fraser, announced that all of these stations, bar one, would close; only Caersws was saved as it was notionally the railhead for Llanidloes. The 7 September 1964 timetable showed five up and four down trains on Monday-to-Saturday as indicated in the table below. There was one up train on Sunday at 8.28pm. 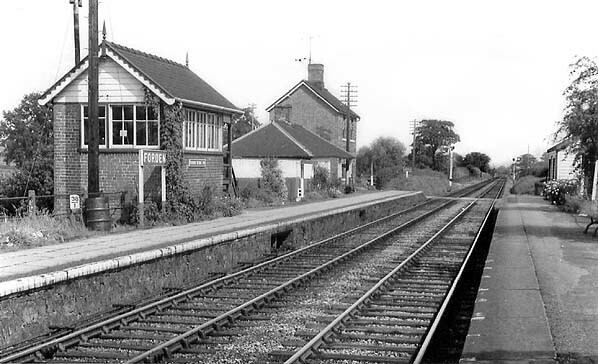 The up Oswestry and Whitchurch trains ceased after Saturday 16 January 1965 as the line between Buttington Junction and Llynclys closed completely on 18 January 1965. 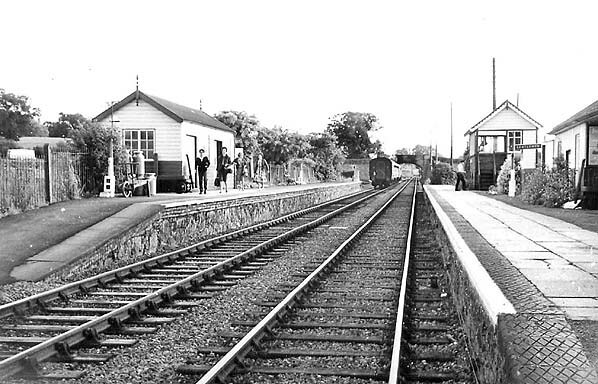 BR [LMR] closed Forden and the other minor Shrewsbury – Aberystwyth stations on 14 June 1965. In 2016 the station house and signal box were still standing but the platforms and the station building had been swept away without trace. 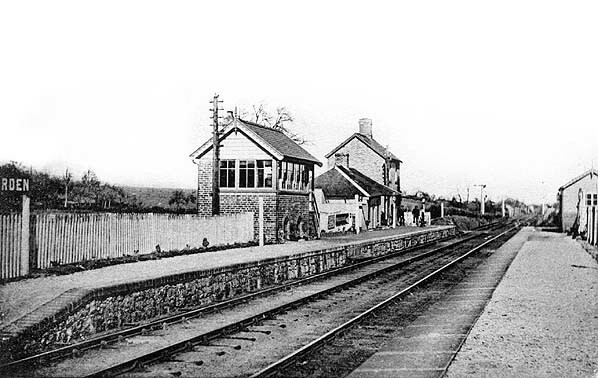 Forden station looking north from the down platform in 1904. It was at this platform that a head on collision between an up goods and a down passenger train took place on 26 November 1904. Forden station shown on a six-inch scale map from 1885. At this time there was only a single track and one platform. Forden station shown on a six-inch scale map from 1903 after a passing loop and additional platform had been added. The goods facilities had also been altered by this time. Looking south along the up platform at Forden in 1963. A down direction train is seen heading off into the distance. The signalman is returning to his box having handed the single line token for the section of line to Montgomery to the locomotive crew. A view towards Welshpool from Fordens down platform in 1963. 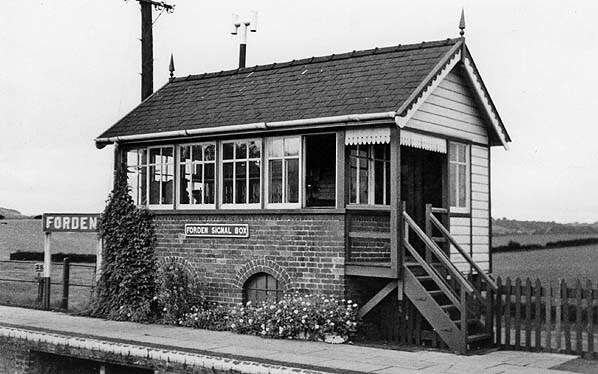 The Forden signal box which was located on the up platform seen in 1963. Forden station seen from an up direction train on 17 June 1964. Milk churns had just been offloaded and the station porter is seen pushing them towards the end of the up platform on a trolley. 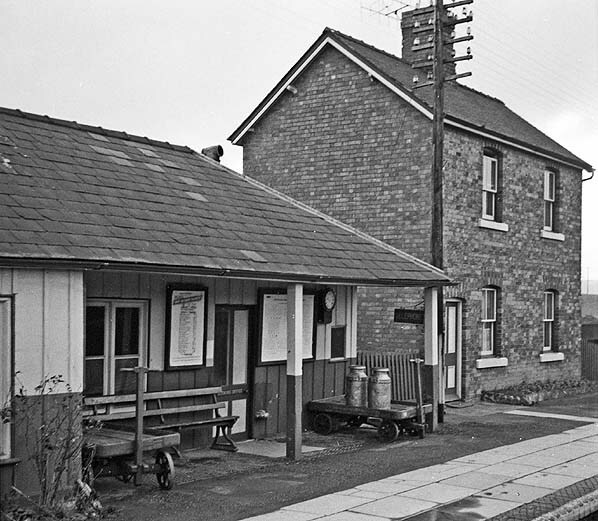 The Forden station building and station house seen in January 1965. 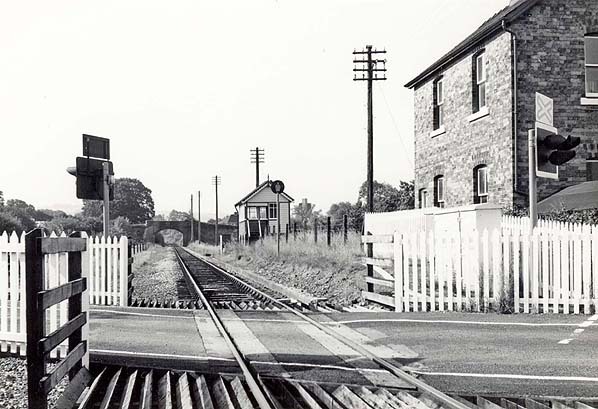 The site of Forden station looking south in August 1974. Looking north at the site of Forden station in April 2016.